Filmmaker and author Peter Greenaway's preoccupation with the deficiencies of taxonomy yields further fruit in this second installment of his 100-book project, The Historians, "an encyclopedic compendium of everything in the world gathered together in one place." 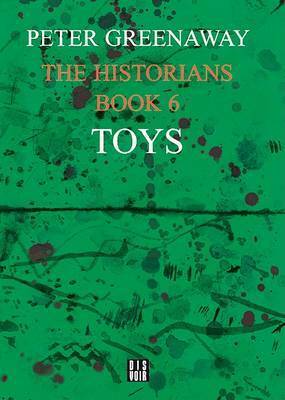 In this volume, Toys, a team of historians investigates the genres, media and function of childrens' playthings, with the aim of making an inventory of their variety and applications; toys, they believe, are a key to determining what sort of adults children become. But in the course of constructing this ambitious inventory of 10,000 items, the historians' mutual competitiveness clouds their judgment to the point of self-defeat and calumny, resulting ultimately in both a gruesome self-reflexive punishment for them and a toy encyclopedia of no use to anybody. This volume affiliates Greenaway with certain of his literary predecessors, such as Jorge Luis Borges and Georges Perec, who likewise parodied the strict conventions of encyclopedias, libraries and inventories. Other proposed titles in this series are stories of cripples, towers, diseases, games, maps, tics, red hats, adulteries, journeys to the sea, languages, names, gardens, acts of violence, pricks, griefs and ghosts.